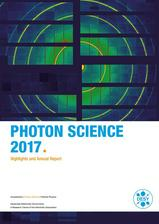 The "Photon Science 2017 - Highlights and Annual Report" presents the activities and the perspectives of research with photons at DESY. A printed version (~120 coloured pages) is available e.g. in the library (room 257, bldg. 25f) or in the DESY Photon Science users' office (PETRA III Experimental Hall "Max von Laue", (room L106, bldg. 47c).